There are a few experiences from my childhood that I now recognize as opportunities to support the greater good. The first was my experience as a Girl Scout (Brownie Troop 1678 represent!). 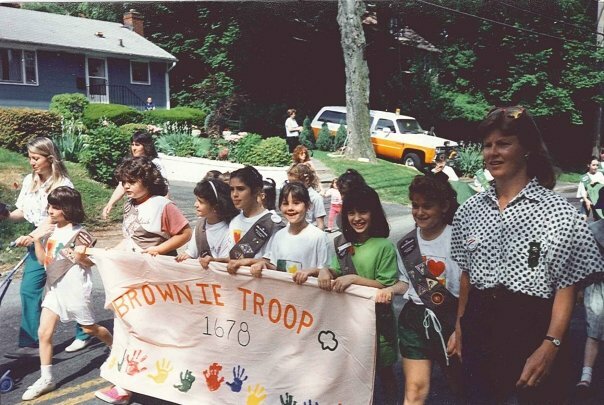 As a Girl Scout, we did lots of fun activities – we camped, we played games, we held bake sales and of course sold the famous Girl Scout cookies (I was a Samoas fan). I was so young I didn’t know that I was part of a larger movement to empower girls, to expose them to the great outdoors and to the larger world around them. The second experience that sticks out in my mind was my father’s involvement with the Road Runners Club. As a member, he ran in 10 marathons in New York City, and countless 5K runs, etc. He usually raised money for cancer, having lost both parents to it. His last run was for heart disease, an illness he conquered, but that’s a story for a different day. I didn’t hear of the phrase “non-profit” until I was older. I didn’t really know about the millions of people working to solve the world’s problems, until I became one of them. I’m lucky enough to know this world now, but I know a lot of people still don’t really know it. I wanted to do more than collect a paycheck from a cause that I worked for and believed in. I wanted to start giving back. There are so many problems in the world, but little by little, we can make a dent. A few years ago, around the time when I got my dog, I found a cause I was truly passionate about. With all that my dog gives to me, I was compelled to give back. I have chosen to direct the majority of my support to the ASPCA, an organization that works to protect our pets. There are many organizations that do similar work, but I chose ASPCA because their message is simple, not too extreme, and as a national organization, they have a wide reach. As I get older, I hope to be able to give more, and perhaps choose a few other worthy causes to regularly support. What the non-profit world does best is to create a community of hope, from the youngest supporters to the oldest. Who we donate to often relates directly to a pain we suffered or an inspiring experience. What we support, what we work to change or improve or advance, defines us and gives us a greater world to live in tomorrow.